/ How Much Would It Cost To Start A Garden? Now first, if you have never been to Lee Valley you don’t know what you are missing. They have the coolest stuff and tools and I find it hard to just leave with one item. Having gone in to get some tung oil the gardening isle beckoned as it’s gardening season and that’s what’s on my mind. I saw a stainless steel edger ($139) and thought… I gotta have that. But then there were these soil block moulds and I thought I always wanted to try those. Maybe this was the year to spend $75 on the set. Even a shovel can cost upwards of $99 as it’s not just a shovel but an ergonomic shovel with large tread for traction. 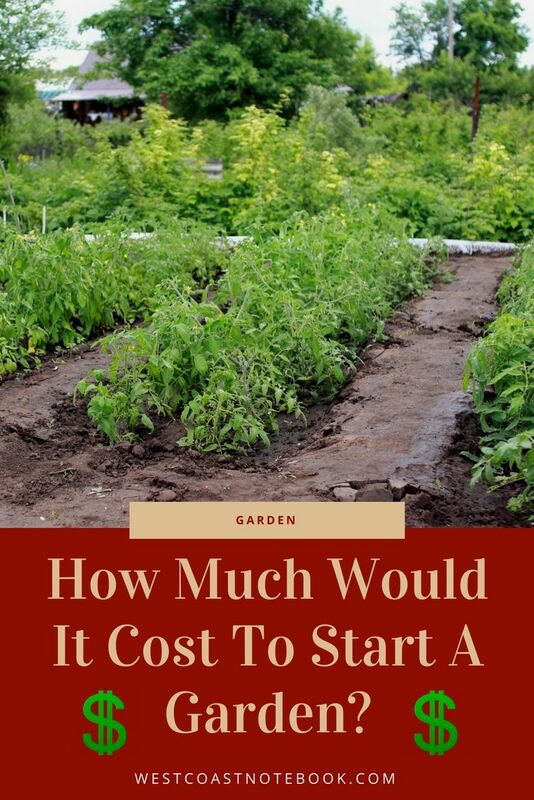 Which brought me to my original question of how much would it cost to start a garden? Because in fact… I didn’t need any of the above items. I have been well conditioned from birth to be a consumer and I’m a good one. 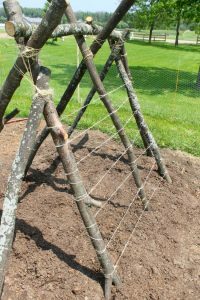 But lately, like today, there was a moment of stepping back and seeing just how one could start a garden with very little money and a few square feet of soil. So… let’s pretend I don’t own anything. Not even a shovel. So where do I start and what do I do. One of the first things to do is a little research. I could head to the library if I didn’t have the internet at home and look at their computers or take out a few books. Find out what grows in my area and in particular the soil type. This is going to be a bit of guesswork at the beginning but if a neighbour has a garden I can always ask for advice. Gardeners are always ready to offer some. Local garden centres are a good source of information as well. Now I know that one needs some tools in order to get going, and if I could just have a couple they would be a shovel, hoe, and rake. I have found that I can do most of my garden work with just these three. The stainless steel edger and the ergonomic shovel are nice, but not needed. So if I just got a $10 shovel, $10 rake and a $17 hoe it would cost me $37 plus tax. But… I have a local swap and shop and I’m thinking that if I go there I could probably get a really good deal on the same items of better quality and maybe spend $15 – $20 on the lot. The first thing I would do is to head down to the liquor store or better yet, the bike shop and get cardboard boxes. The ones at the bike shop are large (bike size) and easy to use. Flatten out the boxes and lay them over the grass and dandelions in the spot I want the garden. 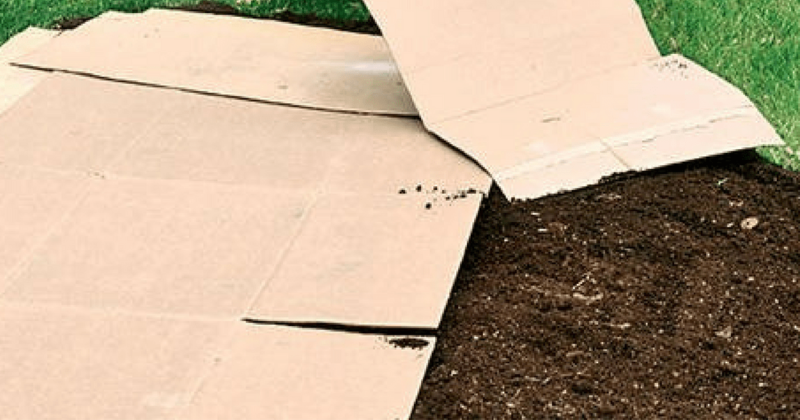 In doing my research I found that I can kill the lawn and weeds under the cardboard by covering it for a month or so, and then it will be easier to dig. So now the lawn is dead and I turn over the soil and cut up the clumps. Taking out any remaining weeds and grass and the odd rock or two that I find. The soil seems a little compacted, but the digging seems to help and there is even a worm or two. Then use the hoe on it to remove any remaining clumps and then rake it so it’s uniformly level. or any other website in your area that has free stuff advertised. Check and see if anyone is trying to get rid of some compost, steer manure, straw or anything that you could add to the soil to help it along or use for a mulch for the top. Buying seeds can be expensive. I have easily spent $50 on good quality seeds for that years planting. And… unless you can get a good deal on seedlings they can add up as well. So, if I’m doing it on the cheap, there are a couple of ways. I know a gardener, so I would contact them first to see if they had any old seeds or extra plants that they started that they want to get rid of. Lots of gardeners overplant and so have extra seedlings. Ending up with some out of date seedlings, I would see if they are viable by spouting them first before I planted them. I do this by putting down some paper towel and wet it thoroughly, put the seeds on it and cover with another wet paper towel. The ones that sprout I immediately plant either directly into the garden or into seed starter trays. Now I know I don’t need to buy seed starter trays as I have some old plastic storage totes that have lost their lids and they work great for starting seeds. I particularly like the ones that you use to put under the bed as they are wide and not too deep. You can see them here. But really… any container would work. Then I would purchase a small bag of peat moss and mix it with some dirt from the garden to put in the totes. A small bag is around $3. It holding moisture in the soil and helps prevent the top of the soil from forming a crust. There are other ideal potting mixes out there, but to keep the cost down, this is good to go. Once I put the soil in I just make rows with a stick and plant. Works a treat. When the seedlings have their second sets of leaves I transplant them into the garden. I am going to be planting some beans, peas and tomatoes that will need some support or trellising. So I head over to Pinterest to see what ideas they have. I’m looking for something DIY that I can do myself with available materials and I spot this one. You can find the instructions and picture source at homewelearn.com. I am going to contact a tree service in the area and if I tell them what I want and why they are usually pretty good about getting me some sticks and will even cut them to length. They seem to like homemade cookies even better than a tip for their services. I found some old bamboo stakes that someone was throwing out and kept those as well as I can just tie them at the top and make a teepee. A neighbour was throwing out an old ladder that was past its prime and I asked if I could have it. It would make a great trellis as well. And I’m sure I could do something with a free pallet or two. I’m just looking around the yard for things that would support a plant while it’s growing. It’s amazing the ideas that one can come up with. Now I have a hose, but if I didn’t, I would just use a container from the kitchen like a pitcher or jug and fill that to water the garden. Might take a little more time, but I also have some free buckets that can be used to make the job easier. Also, if I was able to get from mulch for free like straw I would put that around the plants and overexposed soil and that would help hold in the moisture so I wouldn’t have to water as much. I’m not going to have much compost for the first year to put on the garden, but there is no time like the present to start one. There are fancy bins and DIY projects, but all I’m going to do at this point is to start a pile in the corner of the yard. Maybe if I get really ambitious I can use some free pallets to form a square and tie them together with wire at the corners to hold all the composting items. 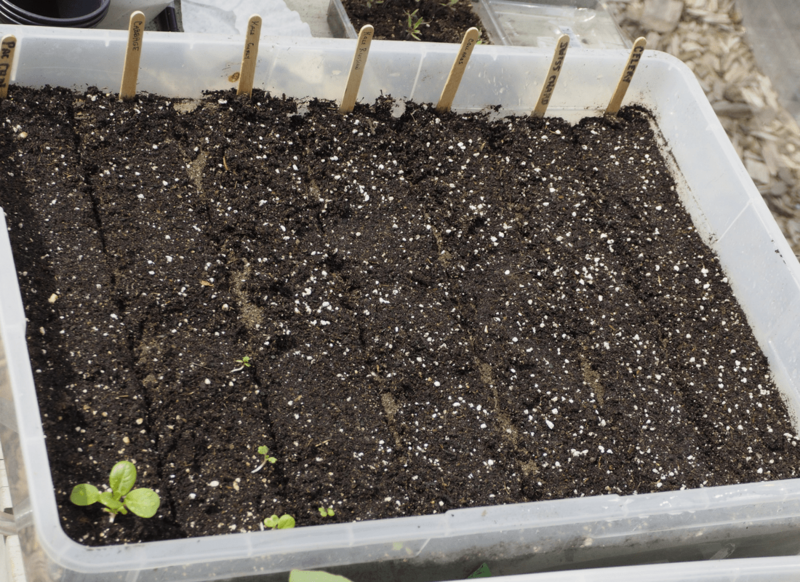 Worm farms seem relatively easy as well… but right now, I’m just worried about how much just starting a garden would cost. I would say that the big cost of creating a garden on a budget is your time. It takes a lot of time to scrounge items, pick them up and repurpose them. That’s why there are so many companies out there selling gardening equipment, seeds, seedlings, and accessories. Big business. On the other hand, doing it yourself can give you a great sense of achievement and fulfilment. This was a fun exercise and it is very doable. If you have never gardened before, you wouldn’t want to put a lot of money into something you may or may not like and this would be an easy way to go about it. If it is something that you enjoy then start a compost and start thinking of ways to improve the soil. The stainless steel edger might still be out of range, but keep your eyes peeled for deals especially in the winter for items you might find useful the following year. But most importantly… enjoy your garden and the goodness it provides. Veggies always taste better straight from the garden! P.S. Oh… and I’m asking all my neighbours to save their leaves for me come fall. Perfect for mulch for next year and great for the compost.